emmAvIdu – AzhwAr prays for the goal that is pleasing to him as the discussion of the goal came up in thiruvAimozhi 2.8.4 “nalam andham illadhOr nAdu puguvIr” (Oh ones who desire to enter the abode of endless bliss). In ninth decad – emperumAn sets out to bestow mOksham (liberation) to AzhwAr as declared by him as the goal; AzhwAr who is of the nature of being fully dependent on bhagavAn like iLaiya perumAL (lakshmaNa) and bharathAzhwAn, thinks “if we desire for a goal for oneself, that will lead to the aspects of ‘I’ and ‘mine’, so it is to be given up like worldly desires etc” and discards that (liberation) and confirms his opinion saying “I don’t care whether I live blissfully in paramapadham (spiritual realm) or I suffer in samsAram (material realm); my only desire is to exist for your sake only” and prays to emperumAn to bless that quickly to him. Explaining these, AzhwAr establishes the essence of liberation in the presence of emperumAn and prays for the same. In the previous decad, AzhwAr said “nalam andham illadhOr nAdu puguvIr” (Oh ones who desire to enter the abode of endless bliss); hearing that, sarvESvaran greatly desires to bestow mOksham to AzhwAr and those who are related to AzhwAr; seeing that AzhwAr says “if you want to liberate me, do it this way – that is, you should not say ‘you are liberated per your desire’ and bestow liberation to because I wanted to be liberated, but you should do it saying ‘you accept liberation for my satisfaction’ and engage me completely for your sake”; Azhwar reveals his mind in this manner and prays to emperumAn in his presence. But why did he not establish this aspect until now? Because emperumAn was manifesting his most auspicious qualities continuously and AzhwAr only had time to enjoy those and was thus unable to establish this factor. But when asked “now also (in this decad too) you are only enjoying his qualities?”, AzhwAr thinks “Yes, that is true. But, his love towards me is ever-growing; so, even if I have to stop him, let me announce and establish my goal”, stops him and establishes the goal to him. When embAr explains the meanings of this decad, he would verify the identity of all those who are present, shut the doors and explain it secretly. When wondering “This (being totally dependent on bhagavAn) is the nature of real goal; what is the need for AzhwAr to establish that?”; Here is the answer for that – though sarvESvaran being the lord for the jIvAthmA, jIvAthmA being the servant of him, bhagavAn being the means are all eternally existing, jIvAthmA‘s svIkAram (acceptance) is required now (to be liberated); similarly, since bhagavAn is independent, he can bestow worldly pleasures etc to the jIvAthmA, one should clearly reveal his/her own goal and acquire that. In the uththarArdham (latter/second half of dhvaya mahA manthram) this (goal) is clearly established. Why should this be established clearly in dhvaya mahA manthram? The means (process) that is explained in the former/first half is common for bestowing all benefits, even for those who seek out ulterior benefits, emperumAn will bestow them. So, what is explained in this decad? AzhwAr establishing his goal as “Let me enjoy endless bliss as muktha (liberated soul) [kainkaryam], or let me enjoy my one self [AthmAnubhavam – kaivalyam], or let me be in samsAram which is total destruction for the AthmA, or even let me suffer in hell – there is no specific restriction; if it is for your desire, I can take any of these; but if it is for my desire, I don’t want any of these; So, you bestow me what is dear to you for me”. Such dealings cannot be normally seen in worldly matters; it can be seen in AzhwAr; it can also be seen in SrI rAmAyaNa purushas (individuals) such as bharthAzhwAn, iLaiya perumAL (lakshmaNa). When kaikEyi said in SrI rAmAyaNam ayOdhyA kANdam 72.24 “rAjan” (Oh king! ), bharatha could not bear it and so he cried out in the assembly. As highlighted in rAmAyaNam ayOdhyA kANdam 82.10 and 82.11 “vilalApa sabhAmadhyE” (cried out in the middle of the assembly) – my servitude is taken away completely from me! As said in “… dhasyubhirmushithEnEva yukthamAkrandhithum bhruSam” (When one muhUrtham (period of 48 minutes) was spent without thinking about bhagavAn, it is fit to cry out like having been robbed by thieves), the wailing will match the aspect/object that was lost. nampiLLai goes on to explain SrI rAmAyaNam ayOdhyA kANdam SlOkams 82.10 and 82.11 eloquently. “jagarhE cha” (found fault and said that) – Like one who censures a person who delayed the performance of sandhyAvandhanam. “purOhitham” (vaSishta who is the purOhitha/priest) – [purOhitha means one who sees the future and gives good advice] – you are seeking out the well-being of our clan [being sarcastic]. “sabhA madhyE puROhitham jagarhE” – He did not follow the rule of Apasthamba sUthram “niyamAdhikramam rahasi bhOdhayEth” (when the guru crosses the line, he should be informed about that secretly) and revealed it right in the middle of the assembly. “rAjyam cha aham cha rAmasya” (both me and the kingdom belong to SrI rAma) – When one person owns two properties, will one property manage another? But, what if the kingdom controlled me? “dharmam vakthumihArhasi” (in this matter, you speak the right words) – “perumAL (SrI rAma) went to forest; dhaSaratha chakravarthi died; kingdom cannot be ruler-less; the foremost among the existing ones should be crowned” – this is the only reason you spoke these words and not seeing me as bharatha. “katham dhaSarathAjjAthO bhavEdhrAjyApahAraka:” (how can I steal the kingdom after being born as the son of dhaSaratha) – How can I accept this kingdom which was given up by SrI rAma after being born as the son of dhaSaratha who died immediately in separation of SrI rAma? When SrI rAma said “Stop [you cannot accompany me to the forest]”, iLaiya perumAL (lakshmaNa) said in SrI rAmAyaNam ayOdhyA kANdam 31.22 “kurushva” (you have to bless me [to accompany you]). It is destruction for [the true nature of] the soul [here, lakshmaNa] when he who is sustained by the togetherness [with bhagavAn] is to be placed in separation. He said “kurushva” (you make me follow you) instead of saying “kuru” (I will follow you). Why should I (lakshmaNa) worry for your benefit [lakshmaNa accompanying SrI rAma is for SrI rAma’s benefit]. Why are you not worrying for your loss? [One of the key principles of our sampradhAyam is – everything exists for the pleasure of emperumAn; if some one serves emperumAn, the full benefit of that is for emperumAn only]. anucharam (travel along) – lakshmaNa explains the method of his service [that is, by travelling along and serving always]. You ordered me to stop since I am qualified to receive your orders. Still, you cannot stop your shadow from following along. Like your shadow, I should keep following you. When SrI rAma said “you locate a spot which has nice river and shade and construct a hut for us”, lakshmaNa became worried thinking “when he gave independence to me to choose the location/form of the hut, that implies he has given up on me [he should have himself identified the location, the layout and simply ordered me to build it for his pleasure]”. nampiLLai goes on to explain SrI rAmAyaNam AraNya kANdam 15.6. “Evamukthasthu rAmENa” (thus said by SrI rAma) – Previously, I (lakshmaNa) was thinking “I lost it due to my fault; but now, he himself is doing things which would destroy my true nature. Now, is there any my true nature left?” and felt worried. “lakshmaNa:” (lakshmaNa) – one who is identified by pArathanthriyam (total dependence on SrI rAma). “samyathAnjali:” (with joined palms doing namaskAram) – anjali (simple salutation) which could re-instate our true nature not just when we destroyed it but even when emperumAn destroys it. It is the process to fulfil all desires. “sIthAsamaksham” (in the presence of sIthA) – in the presence of sIthA who will enforce the true purpose of the salutation. 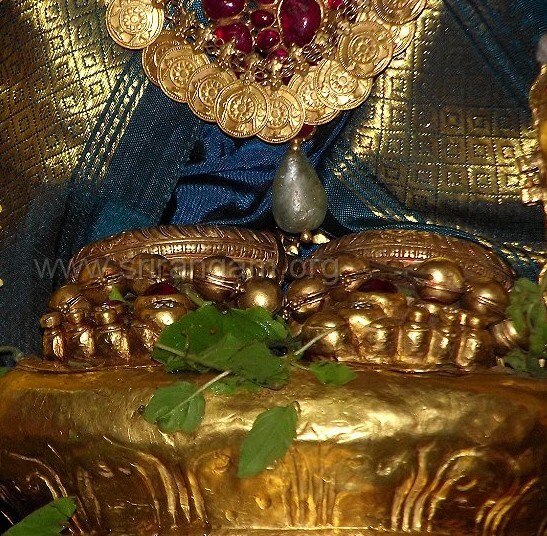 “kAkuthstham” (to SrI rAma) – the family heritage of SrI rAma which even makes the presence of sIthA pirAtti extraneous. “idham vachanamabravIth” (spoke this word) – vAlmIki rishi is praising lakshmaNa for saying this word. As explained in SrI rAmAyaNam AraNya kANdam 15.7 “paravAnasmi” (being fully dependent on you) – my nature [dependent] is not the same as your nature [independent]! AzhwAr is desiring for such pArathanthriyam (total dependence). emperumAn is not caring much thinking “No one is pleasing for such goal; and thus I am not bestowing it to any one; the path to that road is unused now”. What is desired by purusha is called purushArtha (goal). AzhwAr desires “I want to acquire such result [of being totally dependent on you]” and emperumAn approves his desire by nodding his head. This entry was posted in thiruvAimozhi, thiruvAimozhi 2nd centum on June 8, 2016 by Sarathy Thothathri.